The Indian leaf butterfly (Kallima inachus), also known as the "dead leaf" or the "orange leaf butterfly," has the ability to disguise itself in a pile of leaves. The butterfly's unusual appearance and wing coloring make it look like a dead leaf. When the butterfly alights on a branch, it blends in with the tree's foliage. The interior wings of the Indian leaf butterfly exhibit brilliant sapphire shades with bright orange. 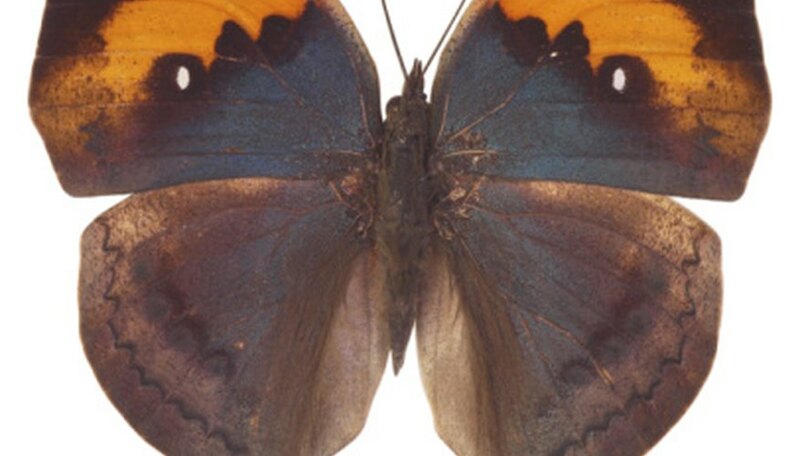 The outer portion of the wings have dull brown and tan coloring that enable the butterfly to camouflage itself amid dead or dying leaves. When the butterfly feels threatened, it will fold its wings tightly together to give predators the impression that it is a simple leaf. Each butterfly has its own individual coloring and patterns that differ slightly from each other. The Indian leaf butterfly is found in parts of Asia, Japan and India. It predominately lives in lush tropical forests, but has been known to venture out of its region on occasion. The butterfly has the distinctive ability to alter its colors with the seasons. During the dry season, the brown of the butterfly turns dull, and during the rainy season, its colors become deeper and darker. It boasts a wingspan of up to 3 inches. The butterfly usually spends its days resting on trees or plants. The adult Indian leaf butterfly forages the floor of the rain forest in search of rotting fruit, which it consumes; they will also eat sap. The larvae of the butterfly feeds only on the foliage of trees or shrubs. After the rainy season, usually from April to June, the adult butterflies breed, and they will breed again during the wet season. Two generations of larvae occur each year. The female butterfly lays her eggs on a host plant that she feels confident will feed the larvae until they pupate into an adult. Birds often hunt the Indian leaf butterfly. The butterfly will fly in an unpredictable pattern to evade the predator and alight onto a tree or pile of leaves to hide. Upon landing, the butterfly will fold up its wings and hold still to blend in with the leaves. If the predator comes too close to the resting butterfly, it will burst into flight. The butterfly's rapid and erratic flight patterns often confuse the bird and give the butterfly a chance to escape. The butterfly usually avoids flying in the open unless necessary. What Does it Mean If Dead Flies Are Stuck to Plants in Your Garden?